My plan here is diverse, and I have to admit that I have not fully planned. 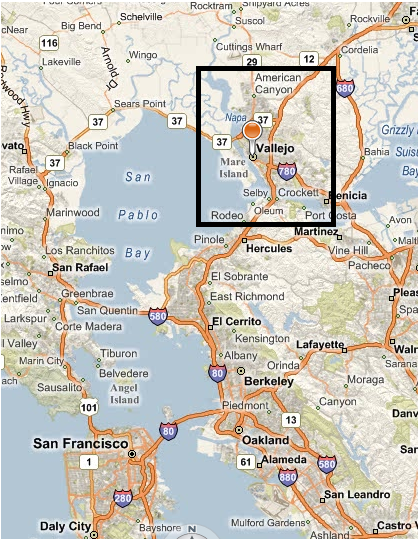 But I’m going to specially look at the city of Vallejo, as you can see in my description (Local development and the socioeconomic factors of Vallejo, CA). This city has many differences with the city I do research for (Frederikshavn, Denmark) but that also has many similarities. Stay tuned for more details. Here I put two maps of the area that I’m interested in. 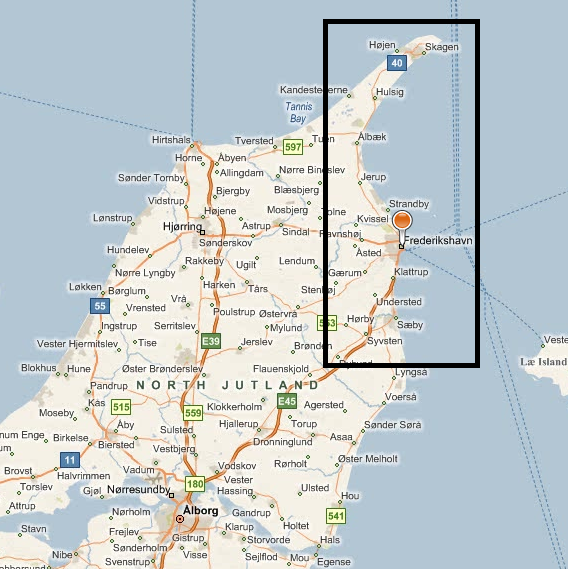 Note that in both maps, south of the black square is where I have my offices (Aalborg and Berkeley). Maps are on the same scale courtesy of Bing Maps. And I have had not time to write. But I will. First, Joe Pine was here at Aalborg University three weeks ago. It was a very good presentation. I’ll tell about it. Also 4 days ago, David Plouffe, the chief campaign manager for Barack Obama’s 2008 presidential campaign and other interesting leaders, presented in in a business leader seminar. They told me it was outstanding, I missed so much I did not go. Anyways I just want to put a video here about a new upcoming event in Frederikshavn. Perhaps it’s not that exciting as the other two, only perhaps. It’s about the yearly Blues Festival of Frederikshavn. They just put it online. I have not written here as I have been busy teaching, writing and preparing my study abroad for Spring 2010. In my last post I said I was going to the Festival of Tordenskjold. Here is a little more about who was this guy Tordenskiold. I have to say I had a great weekend. I found it very interesting because I have been following the preparation for several days. I have talked to over 40 people and learn many things about their networks and how they work. I aim at publishing the results if you’re interested. I calculated myself in the three days and I think there were 35.000 visitors, but I don’t have the official data. 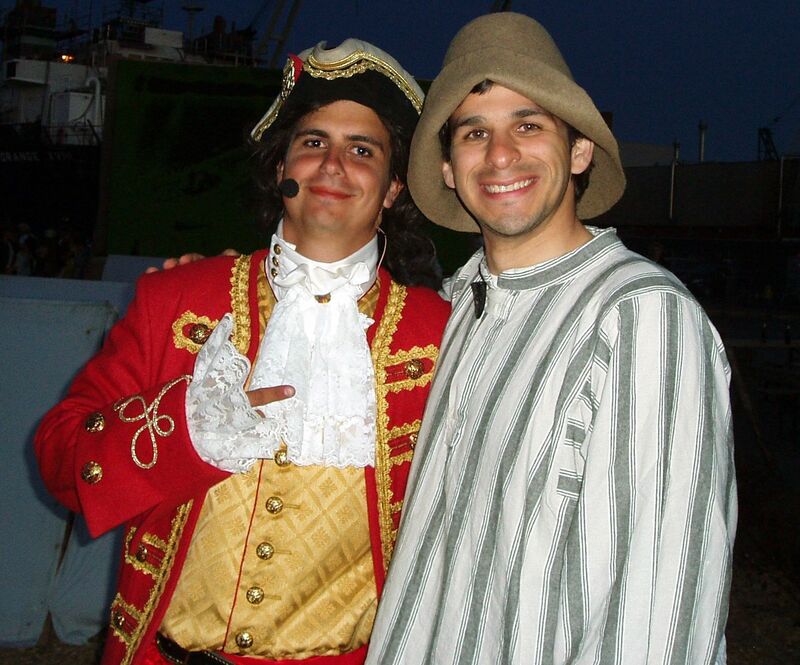 But I know there were around 1000 volunteers, the majority of them dressed for the occasion in 18th century clothes. Here is me and great Tordenskjold, I (and my wife, taken the picture) were dressed as peasants. Here are more pictures of the festival. In photo doesn’t look that big, but the big boat a replica of the time, was really impressive. At least for a non-ocean guy like me. Can a festival save you? Yesterday I spent the day doing some qualitative research in Frederikshavn. They’re preparing the Tordenskjold Festival. I think it’s going to be pretty cool. I will be there. I interviewed and talked to a dozen of people. People love this city project. It’s the whole community engaged. I might give you a summary next week. For this 12th edition, they expect 40.000 visitors. Looking at other numbers, the picture does not look that good. We all know that tourism figures all around the world are doing bad. Here the thing seems to come in the worse moment. Since 2003 the tourists coming by ferry (most Norwegians and Swedish) has been declining from 3.545.000 to a around 2.000.000, with a steady yearly decrease. This year will probably be the worse. A worker in a downtown restaurant was telling me that the last year they made, 35-40.000 dkk (5.000 €) a day. Now they’re down to 7.000 dkk a day. That’s quite a thumping. Needless to say, they’re quite excited about the Tordenskiold Festival starting tomorrow. Comments Off on Can a festival save you?